Graham was born in London, 1956. After leaving school aged 16 in 1972 he joined society photographer, Lenare, for 5 years, learning the basics of photography such as film and print processing, composition, lighting and exposure. It was at this point he became involved in cycling whilst riding 20-kilometres back and forth in to London. Graham took a trip to the 1977 Tour de France in Paris and after winning a small photography competition organized by 'Cycling Weekly' magazine in the UK, a career photographing cycling began. He started photographing British-based races and traveled to Europe to photograph the Tour de France, and Classics like the Tour of Flanders and Paris-Roubaix. So committed to shooting these events, Graham would cycle to and from the channel port of Calais, a day's mileage of over 200-kilometres. Come the mid-1980's, Graham's clients included magazines based in Japan, Australia, Germany, the USA and Spain, where he was the founding photographer for Ciclismo a Fondo. At this time the top racers reflected the nationalities of Graham's clients such as Phil Anderson, Paul Sherwen, Pedro Delgado, Sean Kelly, Robert Millar and Greg LeMond - all of which helped Graham's career greatly. The interest from his new clients in these dominating top racers, meant Graham could break into the 'clique' of cycling photographers on the Continent. By 1987 he was a regular on the circuit. This was the year when he first mounted a motorbike to follow the Tour de France. From this vantage point he watched Stephen Roche win that year's race. Graham is now a World-Renowned cycling photographer, his skills reflected in the importance of his clients which include cycling's governing body the UCI, Bicycling Australia, Cycle Sport (UK), Ciclismo a Fondo (Spain), New Zealand Road Cyclist, Cycling Weekly (UK), 'RIDE Cycling review (Australia)', Cycle Sports (Japan), as well as a host of web-sites. Graham also shoots for many of the top teams and sponsors. Graham also covers the Olympic Games and has done so since 1992. He regards London 2012 as his career highlight because of the atmosphere and superb organisation. Graham operates his own web-site: www.grahamwatson.com and visitors can see same-day race-coverage from over 160 days racing a year. 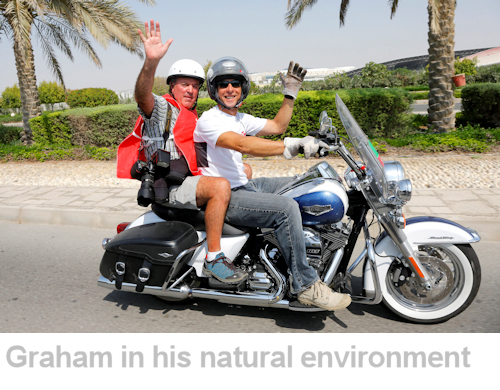 Graham has authored or co-authored over 20 books, including 'Kings of the Road' (1986), 'Visions of Cycling' (1998), 'The Tour de France and its Heroes' (1989), 'The Road to Hell' (1990), 'The Great Tours' (1994), '20 Years of Cycling' (2000), and Landscapes of Cycling (2004). 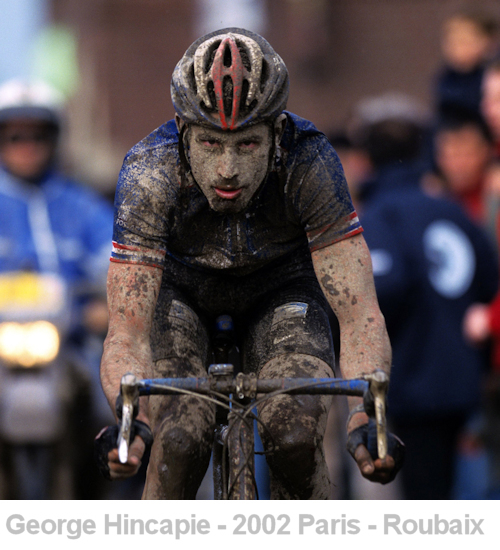 He has been the exclusive photographer with Stephen Roche's 'My Road to Victory' (1987), Miguel Indurain's 'Coraz�n de Ciclista' (1993), and Lance Armstrong's 'Images of a Champion' (2003, 2004, 2005) His most recent titles are 'The Long Road to Paris', a coffee-table photo-book co-authored with Cadel Evans (2011), and �Tour de France Guide� a complete traveller�s guide to the greatest race in the world. 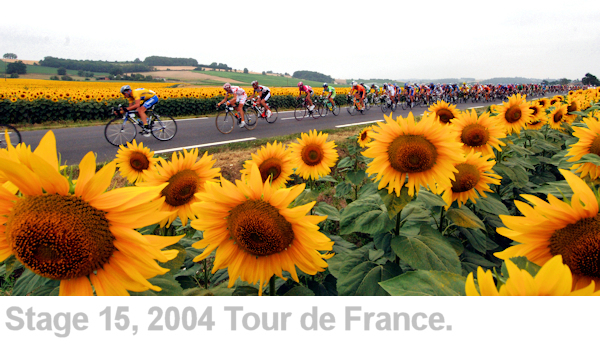 His work has been exhibited many times world-wide, notably with 'Eyes on the Tour de France' an exhibition that visited Dublin in 1998, London in 2007 and Leeds in 2014 plus many more. His latest exhibitions were in Geelong, Australia, during the 2010 World Cycling Championships, and in Leeds during the Grande Depart of 2014. You started your photography career straight from school. Do you think you missed out on a formal photography education? No, at least not in hindsight. A formal education in photography would have seen me miss the all-important 'work experience', which to me had and still has far more credibility than a diploma or similar. I worked with a pro from day one, getting dropped into the deep-end right away, but that reality put me ahead of any conventional photo-education. In the UK, that's where I am from, a formal photo-education would have merely delayed my 'work experience', only institutions like the police force, press-agencies or advertising agencies required a formal education in photography - and only after that would I have (maybe) got an apprenticeship (intern you call it?) to get the experience. So I won 2-3 years by going the old-fashioned way and in doing so I had my eyes far more open to all kinds of photography than if I'd been groomed through photography school. 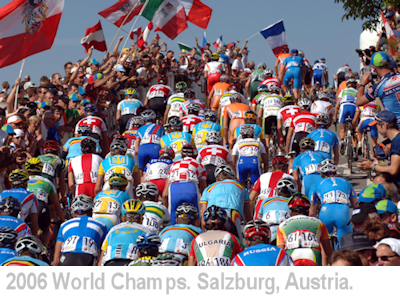 Winning that first Cycling Weekly photography competition helped your career. What doors did it open for you? Well, primarily, it made me aware of what opportunity was out there if I could sell an image so easily (I got paid for the winning image in that competition), it motivated me to go out to more and more races, to build on the chance I'd been given, to exploit it for all it's worth. Which I did. But the image that won was of Eddy Merckx no-less, so it was a popular choice amongst a broader group of people. A bit like an American youth winning a photo competition with an image of Muhammed Ali, back in the day - and so having a sensational launch-pad for one's career. Importantly, back then, 1977-78 saw the influx of english-speaking cyclists into the sport in a big way, and I had unknowingly landed on the moon at just the right time. How did you find your earliest clients? Well, my clients found me really. If you can imagine a world with no fax, no internet, only pigeon-post and a telephone? It was impossible to market one-self as you could today. That Merckx image was the key, it had been printed in the world's only weekly cycling magazine, one that was sold around the english-speaking world. That Merckx image co-incided with an influx of english-speaking cyclists into the sport, and I was right there at the right time - other publishing houses started their own cycling magazines, in the USA (Velo News/Bicycling/Winning) in Australia, in the UK and even in Japan, and most of them came to me because I was the only cycling photographer they knew of. Those days of the late-1970's/early 1980's were vital, in hindsight, for I was getting all the work, and I made sure it was good enough for those same clients to not go anywhere else for as long as possible. 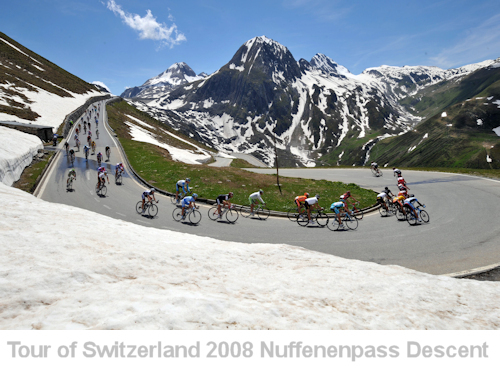 How did expanding out to Spain as founding photographer for Ciclismo a Fonda help your business? For me, my expansion into Spain was as strategically important as my first published image of Eddy Merckx had been. By 1985, I was working for just about every English-language cycling magazine out there, but Ciclismo a Fondo took me into a whole new world - less wealthy maybe, but potentially more valuable because Spanish cycling was so well-established. Also, in a mirror situation of the English-speaking world of cycling in the early 1980's, Spanish cycling in 1985 was on the verge of a massive break through with Pedro Delgado winning the Tour of Spain before setting his sights on winning the Tour de France. And Miguel Indurain was starting his professional career back then, so it was a very good time to get into the Spanish market. It was because of this potential that the publishers launched Ciclismo a Fondo, and they chose me because they'd seen my images in Winning Magazine, at the time the world's most colourful, glossy, magazine devoted to the sport. I'm still at Ciclismo now, 30 years on, and as such have been a part of Spanish cycling without actually being Spanish! You are now a cycling photographer with a World-class reputation, is that a burden or a blessing? Both, I think! It's great to feel I've made a name that people can relate to, I'm quite proud of that fact. And the blessing is I've achieved just about everything I could have achieved - I can ask no more of myself. But the burden is that I know I have to keep trying and trying to improve, to keep that respect and to keep faith with the fans of cycling, to keep moving with the times and trying to produce better images than anyone else. It might be more of a blessing really, because being forced to stay at the top is hardly a burden, it's a challenge that can only be good for me. There must be a pack of photographers who want your place on the back of that Tour de France motorcycle. Why do you think you are so successsful and stay at the top? Well, I had a very good start in 1977/78, and I worked very very hard to build on that 'luck', and am still building on it today. But at the end of the day, clients want top-quality photography, a reputation is one thing but it's the quality photography people want, not the reputation. So I place hard work as being as important as talent and/or luck, and because my photography allows me to eat well, drink well, travel, and have a very good life, I'm always motivated to defend my lifestyle. Maybe others are not so committed, or perhaps haven't had the same success as me and therefore feel less 'focussed'? As regards to the Tour, the organisers have known me for over 30 years, they see the magazines and newspapers that carry the images, and are very selective about who they allow on the race on a moto. They gave me my chance in 1987 and have maintained that respect to this day. But it has to be earned, believe me! Do you have a team who deal with the day-to-day running of your business? Do you still work alone or do you have other photographers who work for you? My wife Jo runs the business and administration side of things, which frees me up to enjoy the good life and just take pictures! (joking..) The Internet has made my business very full-on, such that it is more than a one-person job now, and indeed has been since at least 10 years ago. In addition to my editorial and commercial clients, we also have www.grahamwatson.com to run on a daily basis. This probably accounts for 50 percent of my/our time these days. I still do 90 percent of the photography, but the sport is so worldwide now with several big races taking place on the same day or week, that I have to send other photographers out, my clients expect my work but they also need images from all the other races as well. How has the media world surrounding professional cycling changed throughout your career? It's grown in-line with the popularity of the sport and grown because of the growth of the internet. Back in 1985 I'd photograph the Tour de France and come back to London with three weeks of colour slide film in my pocket, to be processed. There was no demand for daily images back then. We've moved through the debut of digital photography (between 1996-1998) and are still finding ways of getting the images to clients faster and faster. I was still shooting film until 2003, but these days I am sending images out of the camera a minute after they've been taken. Maybe just 500 journalists followed the Tour in 1985, these days it's close to 2,000 and the photography demand has grown accordingly. Despite what some people think, the boom days of Lance Armstrong lifted the Tour (and the sport) to new highs, and although those days are tarnished now, the size of the media has never diminished at all. I'm of an age to remember when I could shoot a stage of the Tour and see my colleagues speed off down the road to have a three-course meal, before them shooting the last hour of the stage, slightly inebriated too! Roll on 30 years, or even just 10 years, now no-one stops to eat at all, the images are published as soon as a photographer can upload them. Social media like Twitter or Facebook has elevated the public's exposure to the sport an awful lot, so there's another angle for a photographer to explore and to exploit, yet at the same time eat up precious minutes of one's already busy day. Well, there's nothing I don't like at all, with the possible exception that the price of photography is coming down all the time, that I need twice as many clients in 2015 to match the income when I had half as many clients 10 years ago! I've noticed that a client who pays top dollar for top photography is in the minority against clients who prefer to economise and pay less for lesser photography. I'm not quite swimming against the tide, yet, but I fear in the years to come earning a nice living like I have will become that much harder. If there is one thing I love about my job it is the sense of freedom and adventure (they come as one package in this life-style) whenever I go to a race. I've always been a freelance, and as such have never had just one 'boss' to answer too - I've had perhaps 20 bosses. But because no-one is calling the shots except me (forgive the pun), I enjoy a sort of freedom that many others never enjoy. Clients trust me to get what I know they want and as long as I achieve that I know my time is always my own time, not someone else's. Adventure is there from the moment I leave home one morning and no two days are ever the same in this business. Whether I am flying, driving, or travelling to a race on a motorbike, the anticipation of a great day to come is always there. I like to think I cope very well, it's one of the attractions of the job, a lifestyle that I know many envy, a feeling of 'escapism' that keeps me fresh and forever grateful. It is not to everyone's taste, but I think I sensed the adventures to be had many years ago, and the solitude of working and travelling alone has been a prime motivation all these years. Clearly, a family life and craving for your own bed each night is not one of the requirements of being a globe-trotting sports photographer. Having said that, I met my wife in 2001 at an age when I could still travel and work and cope with the relationship. had we met 20 years earlier, either the relationship would have floundered or my career would have ground to a halt. During your time with a camera in your hands you must have shot every possible angle of a person riding a bike. How do you keep your work fresh and your mind interested in all things cycling? Well, I obviously love the sport, that's one simple motivation. Secondly, the sport funds a very special lifestyle, and I fight hard to maintain that lifestyle in all its forms - so I will always find new or better ways of photographing cyclists. I also take the time to look at my colleagues' images as much as I can, rather than hide from them I need to see what they are doing, and to see if I can do better or something different to keep pace with them. Remember too, that the sport takes place in some fantastic areas of the world, that too gives me the reason to keep trying to take better photographs. No, I'm totally against working in video, it would spoil my enjoyment of what I do now, and because I have so many clients to satisfy, there is never enough time to even think of doing video. I'd see it as an insult to my 35 years as a still photographer. I know many newspaper photographers who HAVE to film video footage of the same subject they're shooting with their still cameras, and they then have to edit and up-load their still images before editing and up-loading their video footage. There was a time when we thought TV images could be turned into good-quality still images and that the days of a freelance sports photographer were soon going to be over. But for some reason the 'bridge' was never built properly. "Take just one image but make it the best image you can take". My first-ever/only boss taught me how to shoot on a half-plate wooden Kodak camera in 1972, we used giant black and white film that was loaded into a sheath, each sheath was one-shot only, and we then had to change sheaths for a new sheet of film. In total, I'd shoot six portraits of a client in one sitting, no more, and each of those six shots had to be good - or else! Even today, when we can shoot 11 frames-per-second, that same advice counts, one great image is better than ten ordinary images. I was also taught how to know when to press the shutter, when the moment was right, when the subject was looking at his or her best. This applies so much with cyclists, for they only want to be seen at their very best. What advice would you give to someone who wants to break in to the world of cycling photography? Give it a try, give it your best shot, literally. Consider starting with one camera/one medium-length lens and keep your photography simple until you gain experience and buy a second camera-body with a different, maybe longer lens. Look at other photographers' images when you can, learn from them, and eventually apply your own style to a popular method of shooting cycling. The trick is to get images sold as soon as you can, thus gaining the motivation to continue. This can come from building your own web-site, and/or from going out to local races and making yourself known, selling some prints to the cyclists and especially making the organizer aware of your work. Good work always leads to sales, so make sure you only offer your best work to potential clients. Avoid doing what most photographers do these days and load everything up to a server like flickr. It's so annoying to be given a link to someone's images and to then see too many images, or a series of images when just one would suffice. Most pro' photographers and editors are too busy to spend hours looking at someone else's images so keep your offering simple, edit the images carefully, throw away anything you're not sure about. If all works well, a rookie photographer will see some return within a year of starting-out, then it's time to take the next step and go to bigger races where the potential of sales is bigger. Is there one Graham Watson image that defines your career or you are most proud? 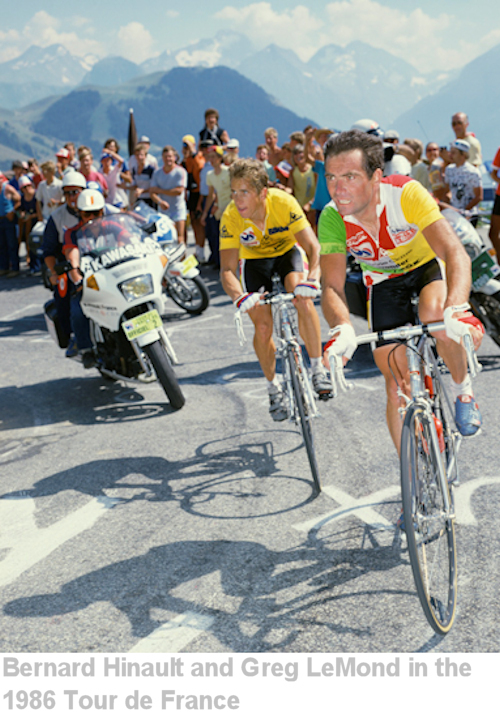 Yes, it's a familiar answer to a very good question - a shot of Bernard Hinault and Greg LeMond in the 1986 Tour de France. I chose a good location, above the Alps at Alpe d'Huez, but the two cyclists made my shot because of the intensity in their faces - an intensity that was at the same time very regal. In those days, no-one wore dark glasses nor helmets, and there were no metal crowd barriers like there are today. No other shots have come close to that one, even though it was taken almost 30 years ago! All images are � Graham Watson and used with permission.